I'm happy to be joining my friend's in the Int'l Bloggers Club to share our first DIY project of 2019. 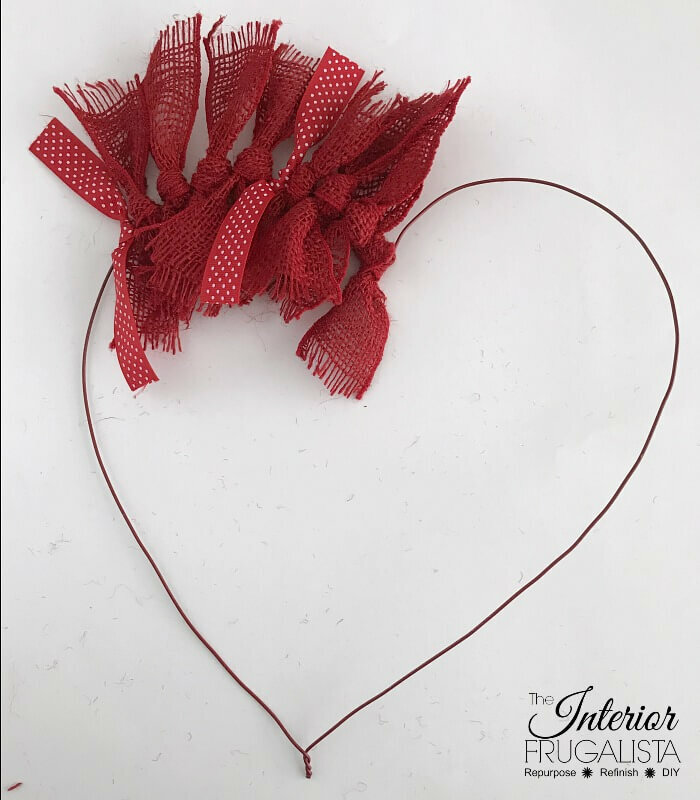 This month the theme is Love Is In The Air where we hope to inspire you with Valentine ideas. I have to admit, I'm not one who decorates the house for Valentine's Day but I always enjoy a seasonal wreath for the front door. In December I made two tabletop Christmas trees with red burlap ribbon. 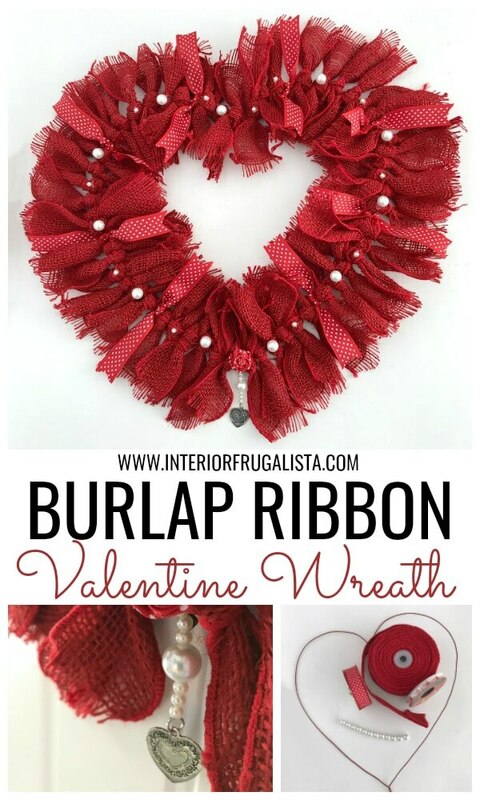 When I had some leftover, I saved it to make a DIY burlap ribbon Valentine wreath for our door. 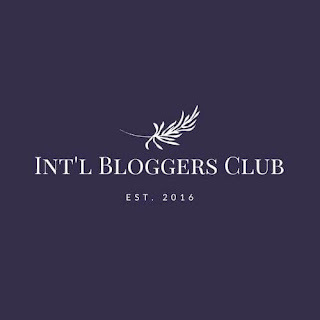 If you're new around here and haven't heard of the Int'l Bloggers Club, we are a group of friends from around the globe who come together every month to share a themed DIY project. Links to my friend's Valentine inspired projects are included at the bottom of this post. In November, our last project of 2018, the theme was Christmas where I shared a Christmas Junk Angel made from a repurposed thrift store metal shelf. 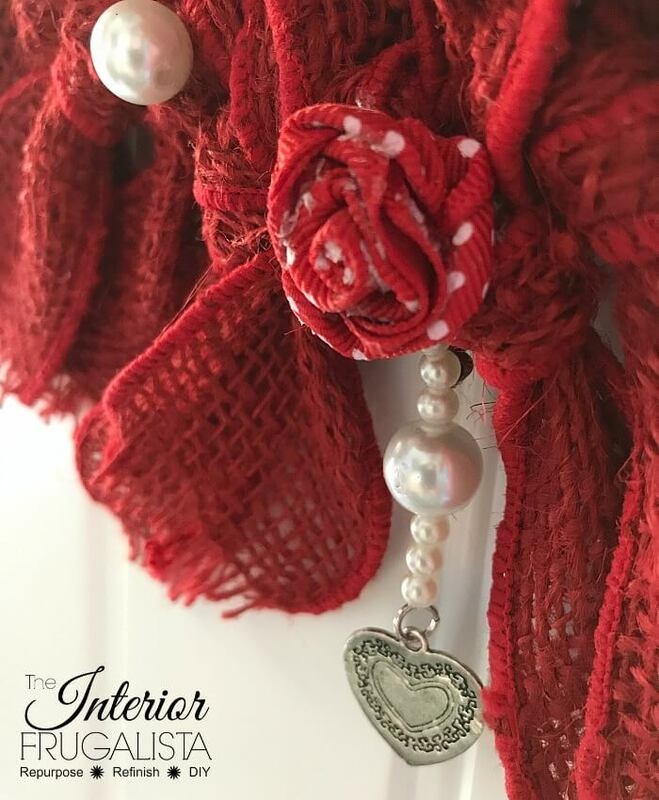 This Valentine's project is a great craft to do while watching television. I made mine while binge-watching the new season of Grace and Frankie on Netflix. This post contains affiliate links so you can see what products I used or recommend to make this wreath. See my full disclosure policy. Pictured below are some of the supplies I used to make the wreath, minus the narrow heart ribbon. First, you'll need a wreath form. You can use a ready-made heart shape metal form or make one like I did. 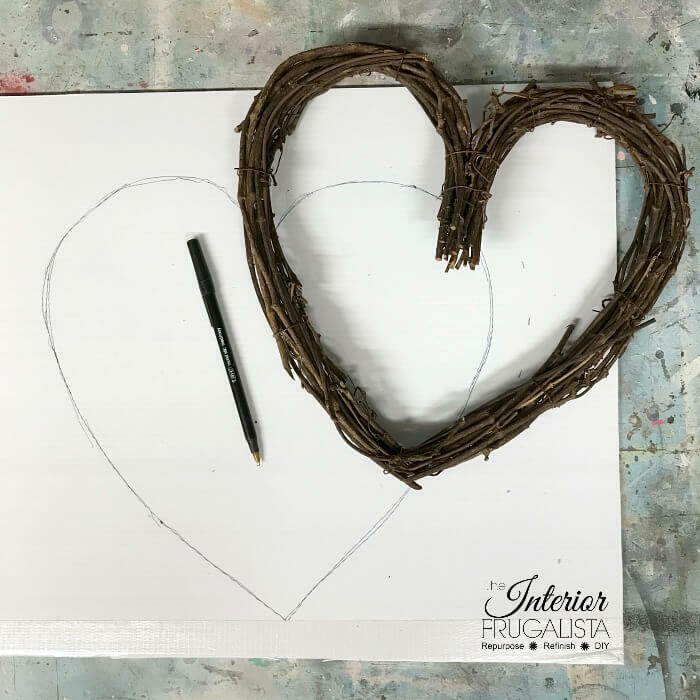 I used a grapevine heart for my template and traced the shape on a whiteboard. You could repurpose a wire clothes hanger or use bendable craft wire like I did. 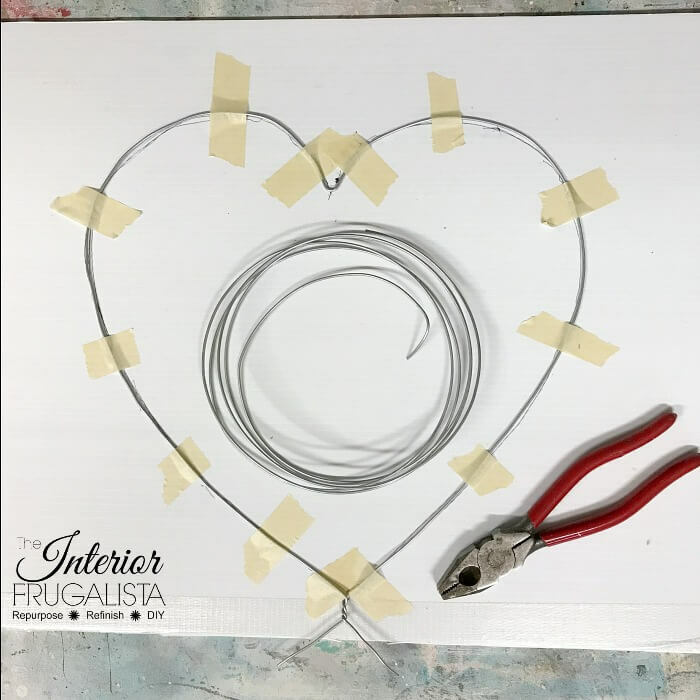 Starting on the bottom point of the wreath, bend the wire over the heart template, holding it in place with tape as you work (pictured below). Twist the ends of the wire together with needle nose pliers and cut the excess with wire cutters. 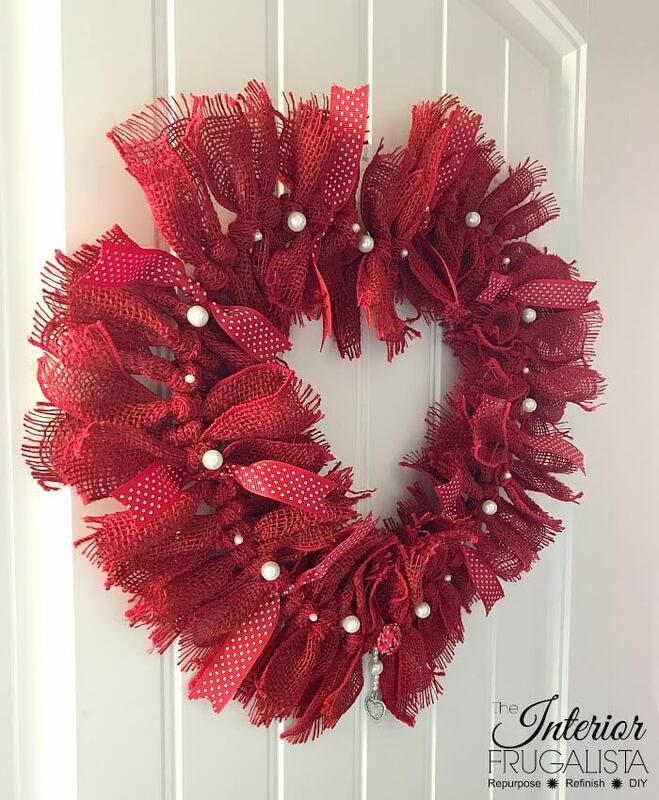 This step is optional but to help conceal the metal wreath form from peeking through the ribbon, I painted it first with Colonial Red Rustoleum spray paint. Here's where you may want to set yourself up in front of the television. 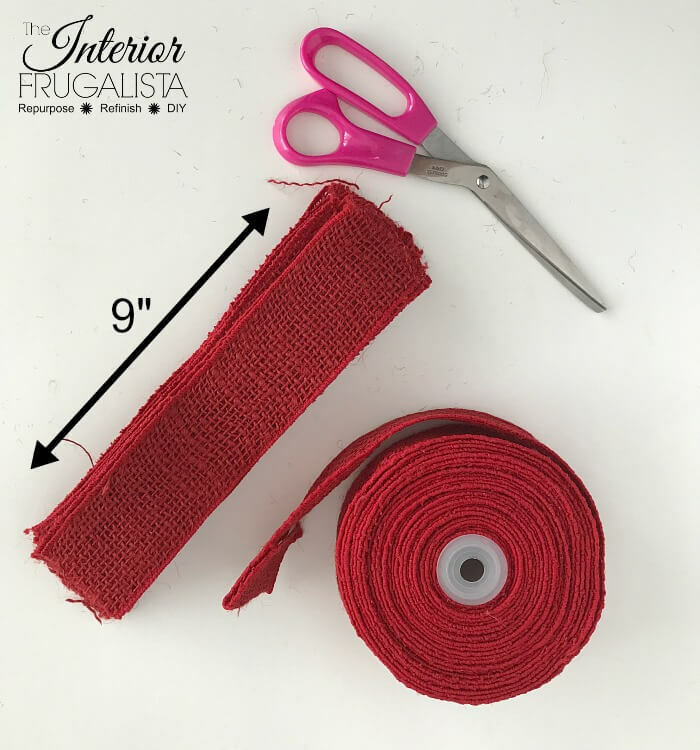 Cut both the burlap ribbon and red & white accent ribbon in 9-inch strips. I used one 3 yard spool of 7/8-inch accent ribbon and 1 1/2 spools of 10 yard 1-inch burlap ribbon. The accent ribbon isn't wired because it was all I had on hand but my preference would be wired. Embrace the burlap fray! 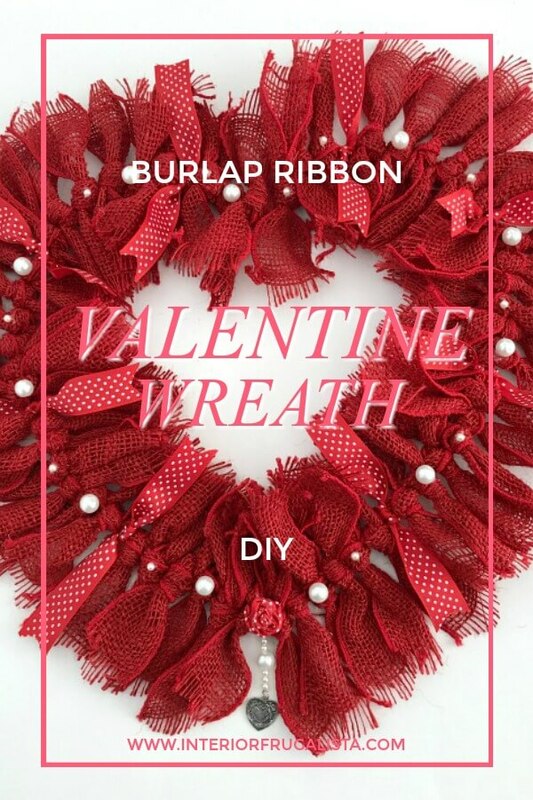 Tie the strips of burlap ribbon around the entire wreath, fraying the ends as you work. Tie eight accent ribbons spaced evenly around the wreath and with sharp scissors make a V cut on each end. Tip: Fold the tails of the ribbon in half and cut diagonally towards the bottom of the ribbon. In my stash of craft supplies, I had some metal heart charms leftover from another project to embellish the bottom of the wreath. I also had a couple of costume jewelry bracelets that I never wear and took them apart to salvage the small pearl beads. Tie clear jewelry cord onto metal heart charm. 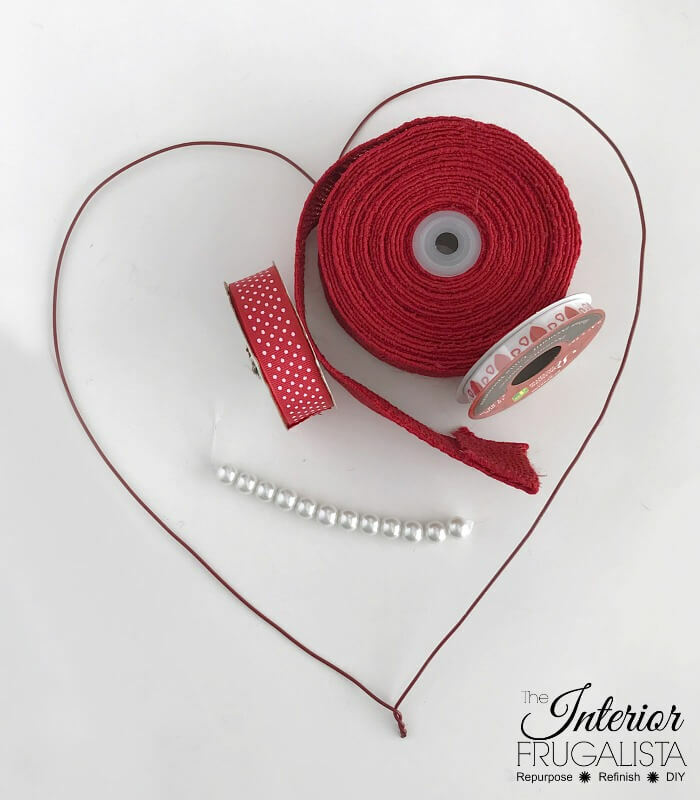 Thread the jewelry cord through three small pearl beads, one large pearl bead, and three more small beads. Tie the cord onto a small jewelry jump ring. Open the jump ring with jewelry needle nose pliers and slip the jump ring onto the bottom of the metal wreath form and close tight. 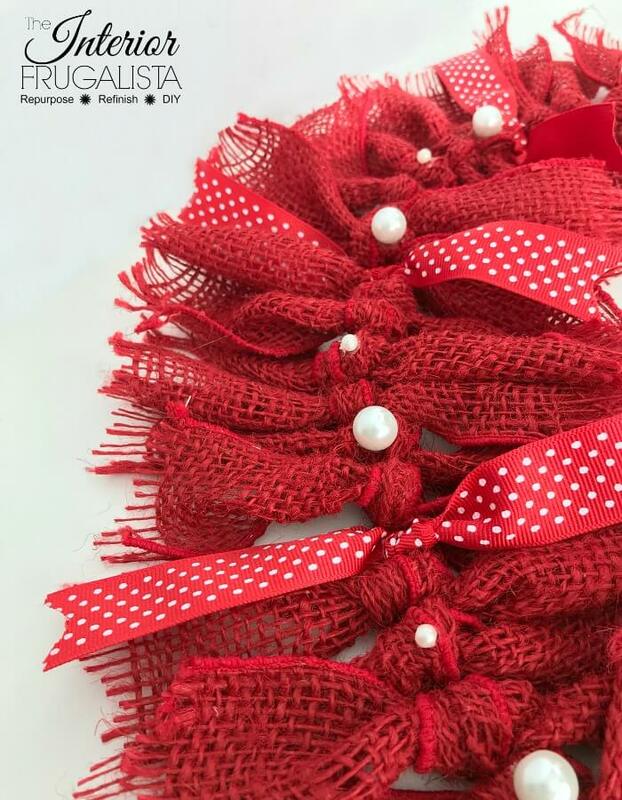 This is optional but with one strand of red & white ribbon make a rosette to accent the bottom of the wreath (as pictured above). If you've never made a rosette you can find a detailed tutorial here in my see drop cloth rosette pillow post. 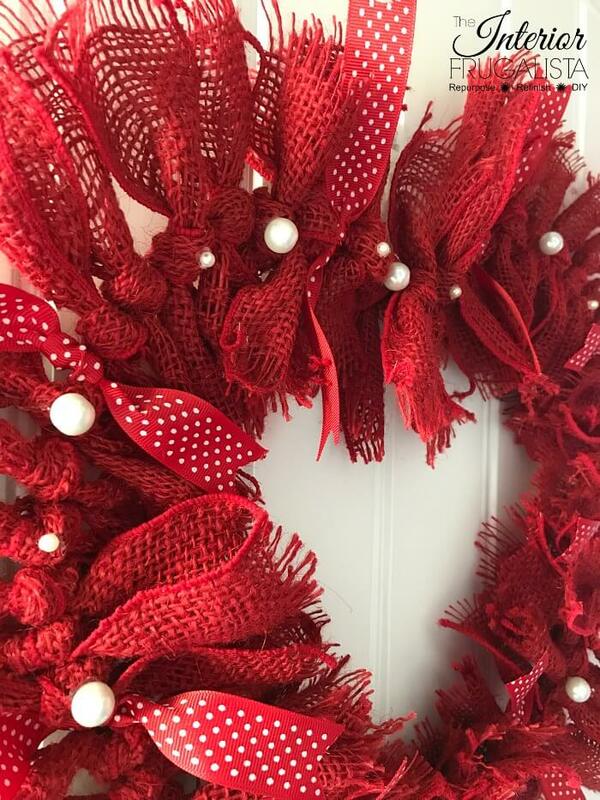 Following the center of the ribbon and spaced evenly around the wreath, glue leftover pearls with a hot glue gun. A pearl costume jewelry necklace would look lovely too. That's it, you're done and hopefully caught up on some of your favorite shows. 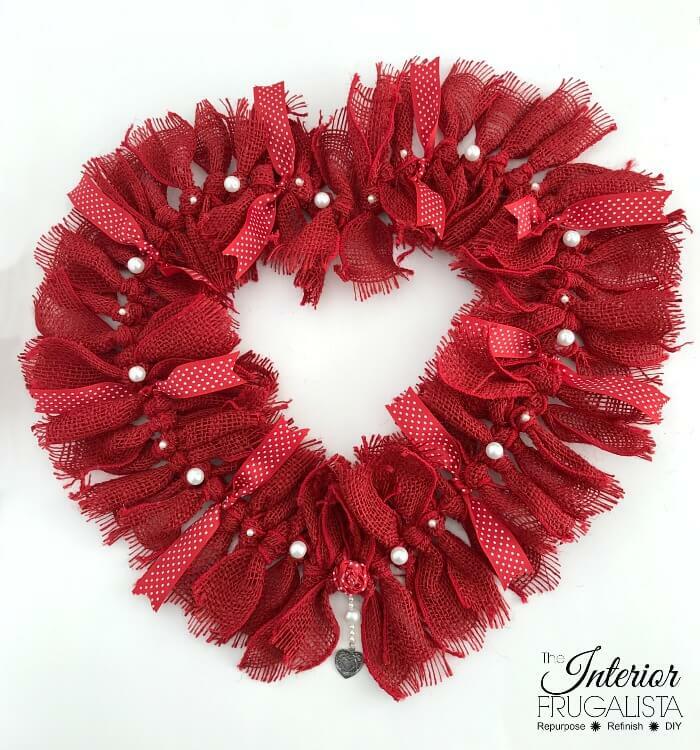 Here's another DIY Valentine's Wreath idea that is so quick and easy to make using a scarf. Thank you very much for featuring my wreath, Bev 😊 Happy super bowl day to you too! You have so many great ideas for heart wreaths. Im seeing one with a scarf that looks interesting. I would love to have you share on #omhgff weekly party. Pinned and now following you on YouTube, Instagram and Pinterest! Thank you so much Karren for your sweet comments and the social media follows 😊 Much appreciated! Happy Super Bowl Sunday to you.